SUBHEAD: We'll soon awake to the reality of the reduced possibility for supporting 7-billion people. Image above: Patrons from all over the Ridgefield, WA region turned out in April for the grand opening of the Ilani Casino. Many were seniors, and few were dressed up for the occasion. 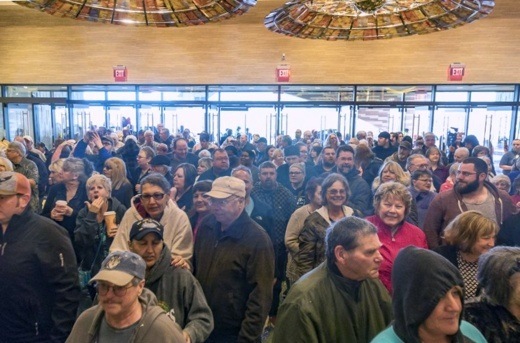 From (http://www.clarkcountytoday.com/2017/04/24/crowds-fill-ilani-casino-for-grand-opening/). These two words are the hinge that is swinging American life — and the advanced techno-industrial world, for that matter — toward darkness. They represent an infection in the critical operations of daily life, like a metabolic disease, driving us into disorder and failure. And they are so omnipresent that we’ve failed to even notice the growing failure all around us. Dodd-Frank was a colossal act of misdirection of the public’s attention, an impenetrable smokescreen of legal blather in the service of racketeering. For Wall Street, Dodd-Frank aggravated the conditions that allow stock indexes to only move in one direction, up, for nine years. During the same period, the American economy of real people and real stuff only went steadily down, including the number of people out of the work force, the incomes of those who still had jobs, the number of people with full-time jobs, the number of people who were able to buy food without government help, or pay for a place to live, or send a kid to college. When that morbid tension finally snaps, as it must, it won’t only be the Hedge Funders of the Hamptons who get hurt. The same over-investments in complexity have produced the racketeering colossus of so-called health care (formerly “medicine”), in case you’re wondering why the waiting room of your doctor’s office now looks exactly like the motor vehicle bureau. The eventual result will be a chaotic process of simplification, as giant hospital corporations, insurance companies, and overgrown doctors’ practices collapse, and the braver practitioners coalesce into something resembling Third World clinics. We’re still struggling to even apprehend the damage being done to people by cell phones — and I’m not even referring to whatever microwaves actually do to brain cells. Many find it amusing to see whole streets and campus byways filled with young people staring into their phones. Whatever they’re gaining in endorphin hits from “being connected” is undermined by the immense losses they’re suffering in real social skills and the sinister effects of behavioral conditioning by the programmers of web-based social networks. These failures are being expressed in new social phenomena like flash mobs and the manipulation of college students into Maoist thought police — and these are only the most visible manifestations. Among the more popular and idiotic strains of diminishing returns is the crusade to replace gasoline-powered cars with electric-powered vehicles. And for what? To promote the illusion that we can continue to be car-dependent and live in suburbia. Neither of those wishful notions is supported by reality. Both of them will soon yield to the fundamental crisis of capital scarcity. What they demonstrate most of all is the failure of this society’s sensory organs — the news media — to ascertain what is actually happening to us. And the recognition of that failure accounts for the current state of the media’s disrepute, even if its critics are doing a poor job of articulating it.